The best cornbread recipe that is sweet, fluffy, and perfect every time – a recipe that I’ve had for years using no special ingredients. The other day on Instagram a fellow blogger friend asked if anyone had a good cornbread recipe and I replied quickly that I had the BEST cornbread recipe. She asked me for a link to the recipe and I laughed because I didn’t have one to give her. 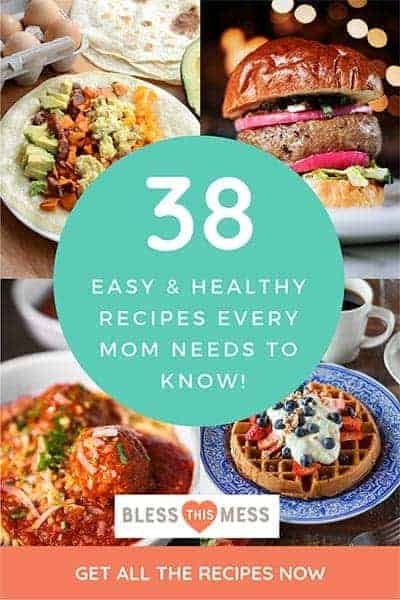 I have been making this recipes for year – years! And I haven’t shared it with you. 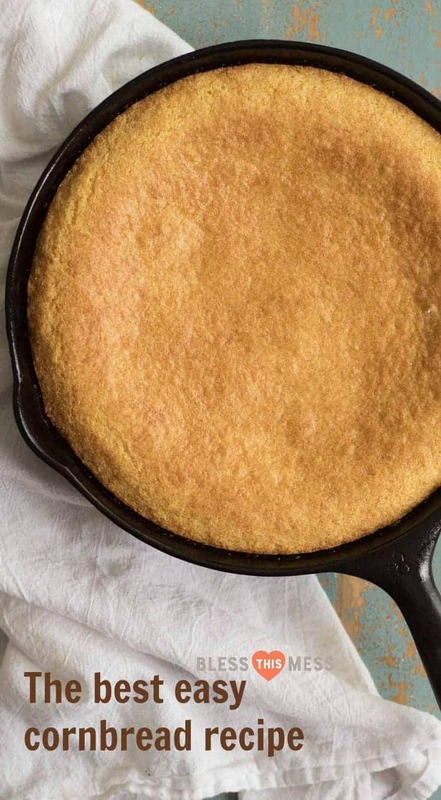 I’m here to remedy that problem and share with you the cornbread recipe that I make over and over again and that turns out great, every single time. What I love about this recipe is that it doesn’t have any special ingredients. You don’t need to have buttermilk on hand or creamed corn and you can make it in whatever pan you have. You can make it in a 9-inch round cake pan, square baking dish, or 9-inch cast iron skillet. Bonus! You can also make these into muffins or double the recipe and toss it in a 9×13-inch baking pan. I have made this recipe no less than 1,000 times, and I love it. It’s sweet but not too sweet, soft without being cakey, and crumbly without being a mess. 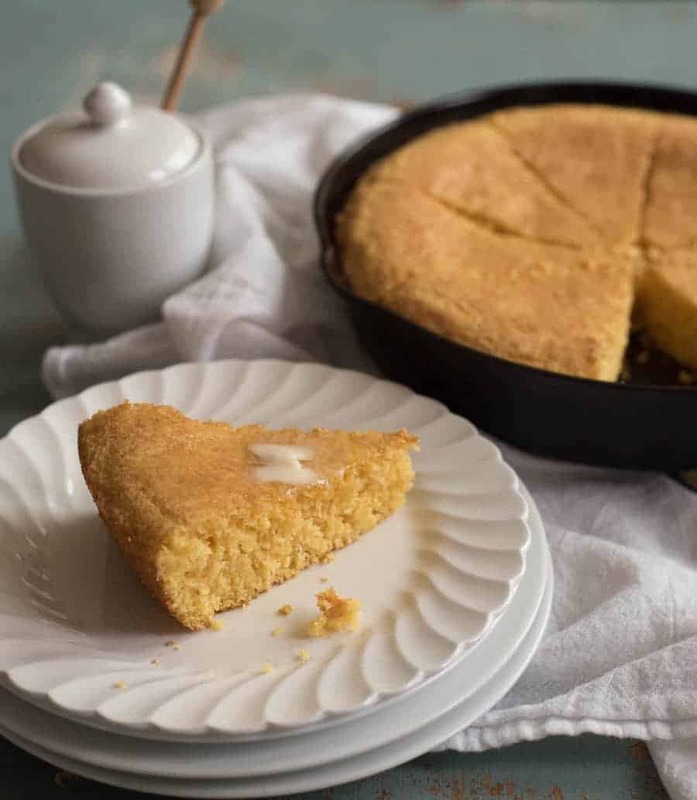 Just an all around tried-and-true cornbread recipe that you are going to print off, make a million times, and pass it down to your grandchildren one day. Last plug for this recipe – it only takes 5 minutes to stir together and another 20 minutes to bake. That means in less than a half hour you can have a hot bread side dish on the table. It’s so quick and easy! I love to have cornbread ready when I make things like soups and chilis. It rounds out the meal and it’s a good option for kids who don’t love what you made (tell me I’m not the only one who has a kid who doesn’t love chili as much as you do!?). You can make it in a 9-inch round cake pan, square baking dish, or 9-inch cast iron skillet. Bonus! You can also make these into muffins or double the recipe and toss it in a 9×13-inch baking pan. You’ll just need to adjust the baking time if you are making muffins or doubling the batch. Muffins take around 15 minutes to bake and a doubled recipe takes 35-40 minutes to bake. This recipe is great with a drizzle of honey, butter, honey butter, or just as it is. 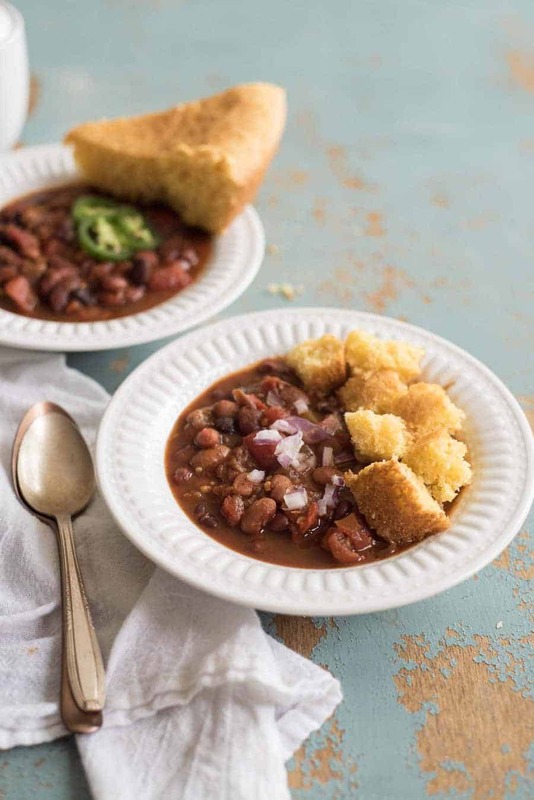 I like to serve it with lentil chili, vegetarian chili (made in the Instant Pot! ), or next to simple baked chicken legs with some roasted veggies or a salad on the side. It goes well with lots of things. How fun is it cooked in the cast iron pan? I just grease it and cook it in cast iron like you would any other pan. I think you need one. I have made this recipe gluten free by simple swapping out the all purpose flour for a gluten free baking blend and it worked perfectly. The best cornbread recipe that is sweet, fluffy, and perfect every time – a recipe that I’ve had for years, using no special ingredients. Grease a 9-inch round cake pan or cast iron skillet well and set aside. Preheat the oven to 400 degrees. In a medium mixing bowl, add the flour, cornmeal, sugar, salt, and baking powder. Whisk to combine well. Make a well in the center of your dry ingredients and add your oil or butter, milk, and egg. Stir just until the mixture comes together and there are only a few lumps remaining. Pour the batter into the prepared pan and bake for 20-25 minutes until the top is a deep golden brown and a toothpick inserted into the center comes out clean. You can make it it in a 9-inch round cake pan, square baking dish, or 9-inch cast iron skillet. Bonus! You can also make these into muffins or double the recipe and toss it in a 9×13-inch baking pan. You’ll just need to adjust the baking time if you are making muffins or doubling the batch. Muffins take around 15 minutes to bake and a doubled recipe takes 35-40 minutes to bake. Seriously, your next bowl of chili needs this cornbread recipe. Your family will cheer your name. Enjoy from my kitchen to yours, Friends; it’s a good one. One egg is listed twice. But step #3 notes “egg.” Is it two eggs or perhaps a typo? Just trying to clarify before I make this recipe. Looks too good to pass up! I’m so glad you asked, it wad a typo on my part. You just need one egg and I had written it twice in the instructions on accident, all fixed and THANK YOU! If I use butter milk instead of whole milk, will the cornbread be even more moist. I had bad experience with other recipes which it came out dry. This one isn’t at all dry but you sure could use buttermilk, it’ll help it be extra tall too! Might I use a cup of corn flour in place of regular flour for this recipe? There’s not gluten in cornmeal so I think that you’d end up with super crumbly cornbread that wouldn’t be at all what you were hoping for. I don’t think it’ll work with no white flour in it though I have made this recipe with gluten free baking flour and it works great just FYI. Made this recipe and my husband just love it thank uou for sharing your recipe. Woohoo! So glad you love it as much as we do! Thanks for leaving a comment. What is a gluten free baking blend? Do you use the coarse or fine ground cornmeal? Also, would skim milk be okay or should I use one with more fat? Mine container just says cornmeal, I assume a more fine cornmeal would be better. And yes, I have made it with skim milk with great success. Do you just mean gluten free flour? I sent you an email. It’s a gluten free baking blend that has a few different things in it! THIS IS THE BEST CORNBREAD EVER!!! Thank you! Easy enough for my 11 year old to make! can I make this with almond milk? I think it would work just fine! Let me know if you try it, I’d love to hear back. Amazing recipe. Thank you for sharing. Hi! Your indredients say oil or butter, but your instructions imply both. Could you please clarify. I served it with a split pea soup Wow, perfect combo! Thank you! Sounds so good! Thank you for leaving a comment! Awesome recipe. I added a few ingredients to my taste profile and was very happy with the results. I put a cup of frozen corn in my blender with the recomended oil from the recipe, I then added about five tablespoons of cream cheese, and the allotted milk from the recipe and blended until liquefied. I combined this mixture with the rest of the recipe ingredients plus one additional egg and stired for about a minute. I then added around a cup of mild cheddar cheese and some jalapenos with a bit of the brine from the jar and stired about a minute. I recommend cooking on the top shelf for 25 minutes. So good. I enjoyed mine with a roasted chicken and pork fricassee. To make the fricassee sauce combine in order, two cans cream of mushroom soup, milk, three dollops of sour cream, five tablespoons of cream cheese, about a cup of chicken stock, and the drippings from the prepared roasted meat. I added one yellow onion, mushrooms, and corn to the sauce to taste and cooked together. Roast meat, carrots, and potatoes together, but seperate from the sauce until the end, leaving vegetables thickly cut for equal cooking time . After the meat, carrots, and potatoes are done, stir in the drippings from the pan to the fricassee sauce. Last, add the meat, potatoes, and carrots to sauce and simmer or slow cook for 30-60 minutes. Best fricassee and cornbread that I’ve ever had. So glad you liked it! I can’t wait to try your recipe too, thanks so much for sharing it with the rest of us, sounds delicious! Very happy to share good recipes. Hope it’s one you and your family can enjoy for many years. It’s a variation of one I learned in culinary school. Even better with a nice garden salad. Good eating everyone. This is basically the same recipe I’ve made for the last 50 years, but with less sugar. Tomorrow some friends are getting together for a chili lunch & I was asked to bring cornbread. I used butter flavored coconut oil for the fat. I drained the liquid from a can of whole kernel corn into a measuring topped it up with almond milk, added the corn in with the milk. Halved the sugar. I used an 8 inch pan, had a bit extra batter, put in a greased coffee cup & put in microwave oven for a minute & a half, it was really good. Had it with supper. Try adding some choppeed pickled jalapenos, it will zing it up nicely. I usually am not a fan of sweet cornbread, but this was delicious! I followed the recipe as is and it was perfect and easy. I can’t believe how fast and easy this was. I doubt that a boxed version would be as good. Seriously so quick and easy isn’t it!? It’s one I make over and over again and have memorized! Can I make this with soy milk or almond milk? Yep, it works just fine! Use one that is unsweetened and unflavored of course, but it works well! Struggled to find yellow cornmeal where I live in NZ and tried instant polenta as a substitute – fantastic! Yay! I’m so glad it work and thank you for coming back to let us know so that others can have success too! Hooray! Thanks for coming back to leave a review. I really appreciate that! Lucked up and found your site on a google search for cornbread. I’ve been trying different cornbread recipes for years and I’ve always encountered and after taste whether it be from scratch from the cornmeal recipe on the package or the boxed mix. I tried this recipe with good vibes from the photo’s and the comments and your recipe was ‘spot on’ delicious, It is now my all time favorite for taste, texture and ease of baking. Love a great review! Thank you! We love this recipe too and make it over and over again! Really good except too sweet for me. Will cut the sugar in half next time. Thanks for a great recipe and perfect for my 10-inch skillet! Finally I can make decent corn bread!!! Thank you so much for this recipe! It truly is the best! And it’s so fool-proof! It’s one you’ll be making over and over again for years to come because it just works out great. THANK YOU for leaving a comment! I loved this easy cornbread recipe. The only changes I made were to heat my cast iron to get a crunchy bottom and throw in a handful of frozen corn. Sounds like wonderful additions, thank you for sharing! Did you need to cook it any longer to account for the frozen corn? I’d love to try it! Can’t wait to to try this recipe! At what temperature do you bake the cornbread? Thank you! You bake it at 400 degree F. Donna! Hope that helps, it’s a great recipe! 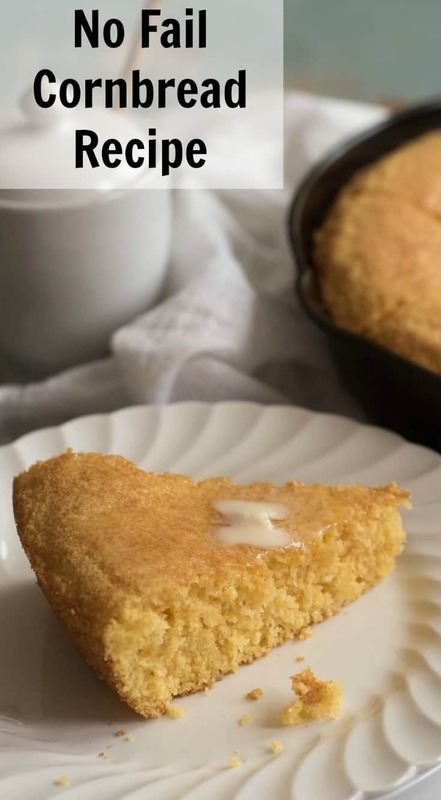 I love sweet cornbread and this recipe is great! I baked in a cast iron skillet. Also it freezes well….just as good when I unthawed 3 weeks after freezing. Great with mustard greens, cabbage, beans, and I am sure, everything else. The next time I make dressing I will use less sugar as I prefer less sweet cornbread for my dressing. So glad that you liked it! And yes, I reduce the sugar by half when making it for dressing too! This was great—comes together very fast! I halved the sugar, but I’m planning to halve it again next time I make this, no more than 1/8 cup. For anyone wondering, you can substitute almond, soy, or any other nondairy milk 1:1 for regular milk. And you can add a dash of vinegar to the milk before you start the first step to make a buttermilk substitute that will be ready by the time you need to add it to the flour (5-10 mins). Thank you for all of the tips and tricks to make this dairy free! Very helpful for everyone here. My 7 year old made this (with my assistance in putting it in/taking it out of the oven of course) and I have to say it was delicious. My kids almost ate half of it by themselves, and the hubby agreed it was delicious and the recipe is a keeper! Moist, fluffy, and with just enough sweetness. I love that! Congrats on getting your kids in the kitchen mama! This is one that my kids like to make as well. I’m so glad you all liked it as much as we do. I made this recipe tonight for my husband. It’s amazing! I added honey to the batter and baked it in my cast iron skillet. It turned out perfectly!! Thank you, will be making it again!! Many recipes use different temps. I have read all comments and the recipe and I can’t see your best recommended temp to cook at. It’s stated in #1 of the recipe directions, it should be 400 degrees F. Hope that helps! Really good, the texture is great. I know it’s one of the better cornbreads since I keep circling back to the kitchen to have another little piece! Hoooooorrraayyyy! This is the kind of great comment that keeps me going! Thank you for taking the time to leave it, that means to much to me. That sounds so delicious and I’m so glad that you love it. 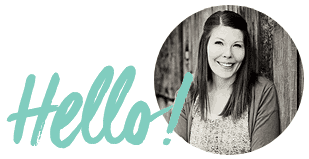 If you share, I’d love to get that Brunswick stew recipe from you! 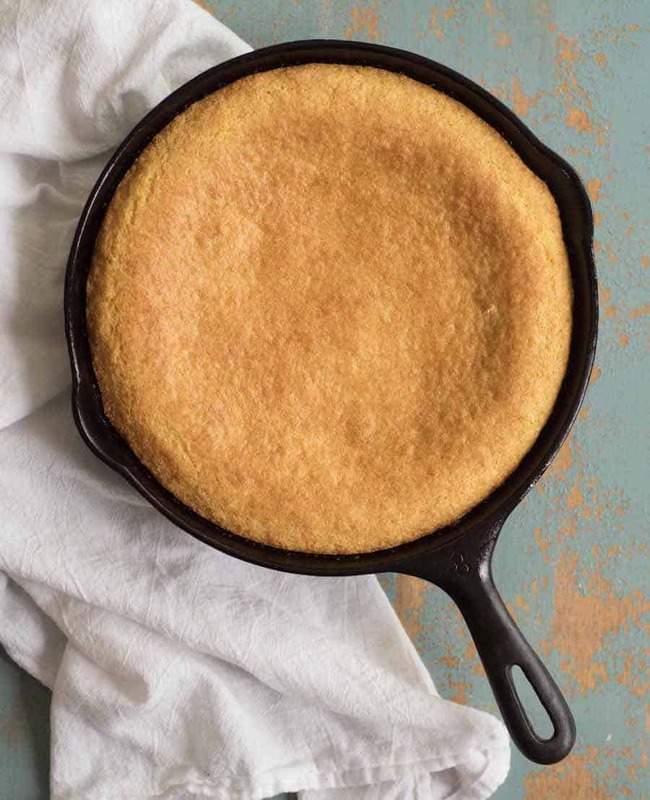 Do you use self rising cornmeal and plain flour in your cornbread recipe? Nope, no self-rising anything, just yellow cornmeal and all-purpose flour for this recipe. Happy baking friend! Love your cornbread recipe. Do you use self rising yellow cornmeal and plain flour? Isn’t it great that it works with GF flour too! I’m so glad you are having success with the recipe! Mmm mm mmmm!! This cornbread is sooo delicious! My husband said it’s the BEST he has ever eaten! Thank you for sharing your recipe. I will definitely use it from now on. Thank you for sharing the recipe with others and coming back to leave a 5-star review, that means so much to me! Happy baking Amy! Perfect! It was exactly what I wanted. We love this cornbread, very moist and delicious. Hooray!! I hope you make it a million times like I have and love it every time! I don’t have milk in the house but I do have evaporated milk. Will that work? Or water? Yes, I do think it’ll work great. It might be a bit creamier as in thicker so just watch your cooking time (might need a few extra minutes) but I think it should work pretty well. You might also consider doing half evaporated milk and half water. I think both options would work great. Will you let me know what you do and how it turns out!? I’d love to share with others if we have a success! I am English and have often wondered what corn bread was. I live in Cyprus so the challenge would be the corn meal. The lady assured me that, although it was called corn flour, it was actually corn meal and it was definitely yellow so I took a chance. Wow, it is gorgeous, I only put in half the sugar as we English do not like our baking to be quite as sweet as you Americans like it but I made some veggie soup and served it with the hot corn bread. Why have I waited so long to try this yummy bread. The two of us have already eaten half of it, we finished our meal with a slice each on which we spread some butter and blackcurrant jam. We will finish the other half tomorrow with the rest of the soup. And I have to add it was so incredibly easy to make, it did indeed take no time at all. Even at the age of 75 I am still game for new recipes and new ideas, thank you. This comment made my night! Thank you, I even read it out loud to my husband because it was so fun to come across my inbox. Hello from across the pond and thank you for coming back to leave a great review and introduce yourself. I hope you find many more recipes to try here on Bless this Mess! And if you ever make it to Southern Utah you are invited over for dinner. 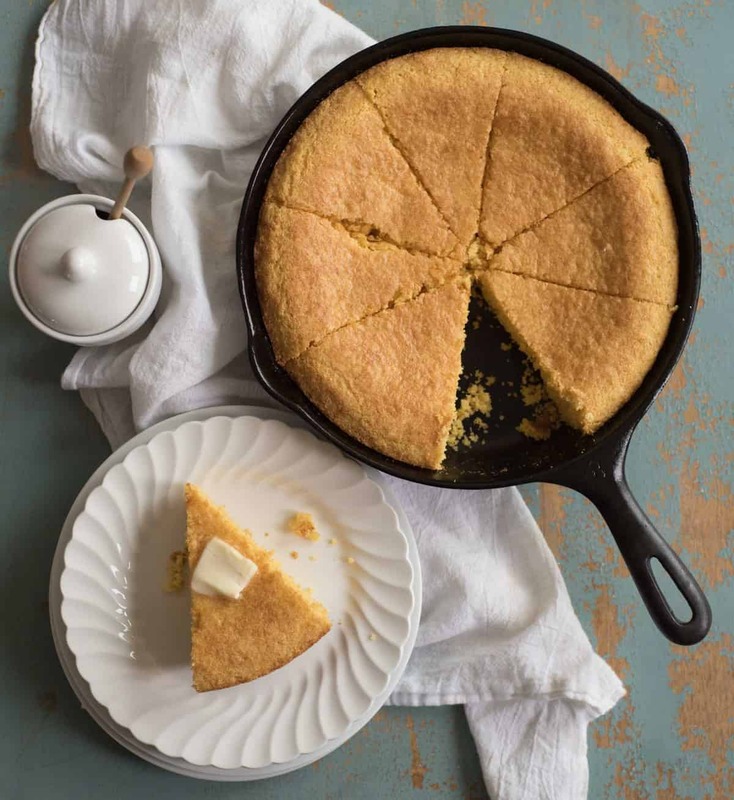 This is incredible cornbread – I could barely wait for it to cool to taste it; wow! Go glad you liked it! And thank you for coming back to leave a comment and review, that’s so helpful to others and me! I think you could stir in about 1 cup of whole kernel corn (canned or frozen, but if it’s frozen run it under a little hot water for a minute to warm it up a bit) at the very and and it should work out great. I’d love to know if you try it! Tried your recipe for the first time today. OMG! This is the best cornbread ever. Thank you. Any easy too huh?! Thanks so much for coming back to leave a comment! I appreciate that! I made this but I think I misread the baking soda amount.Three 1/2 teaspoons (1.5 teaspoons) or 3.5 teaspoons. I did the later and the result left a bitter aftertaste. Thanks for clarifying! It’s 3.5 teaspoons but it’s baking powder and not baking soda. The soda will definitely leave you with a bitter taste. Try it again with the baking powder and I promise you’ll love it! GOOD LUCK! PS. I make a whole batch of biscuits once with so much baking soda instead of baking powder and they were INEDIBLE. LOL, you are not alone! This was excellent! Thanks so much for my new go to Cornbread recipe! Love to hear that! And thank you for coming back to leave a review and comment, it’s so appreciated! Thank you Madely, I do appreciate that! I discovered I had no all purpose flour so used only cornmeal, plus I added a little grated cheese for interest, and it turned out perfect! That’s so great to know! Thank you for the tip, I’ve had other people ask and I didn’t think it would turn out well. Your feedback is appreciated! My Dad always said, “Do not change recipe until you try it first.” I did…It was great….Thanks…. Being curious I will try warming skillet and less sugar, but I do not think it will change my mind. It was so like my New Yorker grandmother who originated from Canada. I’m so glad that you liked it! You’ll have great luck warming the skillet first (sometimes I’ll warm it with a pat of butter in it), and you’ll get a crispier crust on the bottom and I know that people have had good luck reducing the sugar to meet their tastes too. It’s a pretty simple recipe that adapts well to what you like. ENJOY! And thanks for leaving a comment. Awesome simple cornbread recipe. I giggle every time I see the note about using yellow cornmeal, as I only use blue cornmeal! Makes for some pretty bread. How cool! Where do you get it?! I’m not sure I’ve ever looked for it! I think that sounds like a fun one to try! Do you preheat the skillet in the oven or do you put the batter in a cold skillet? You can do either one. Most of the time I just put it in cold but you can preheat if it you like with a little butter in the bottom and it’ll make the bottom crispy. It’s delicious both ways. I am always somewhat skeptical about recipes that claim to be the best. But in this case it is absolutely true. I used powdered buttermilk and reduced the sugar. The result was a moist and tasty pan of cornbread. This will be my go to cornbread recipe from now on. Thank you Melissa! I’m so glad that you like it as much as we do! Had a hankering for some food after my exam and I made this. I doubled it because I have a 12 inch skillet and it came out great with a little extra cook time. Thanks for the recipe! I have a big 14 inch skillet that I make double batches of this in too! I’m so glad that you liked it, hope the exams went well! This recipe was great. I made it in cast iron. I substituted dark brown sugar for granulated sugar, because that’s what I had. I used coconut oil for grease. It all came out great and was fast and easy. That sounds so good! I’m so glad you like it. Hi Melissa, do u use corn meal or corn flour? I’ve been reading the comments and all seems good in it. I’ve been looking for a quick and easy recipe for corn bread since I have fresh milled yellow corn and I have the corn meal. I came across with your recipe with all nice and delicious comments, I love to try this tomorrow morning. I hope it will be a success. Thanks a lot. It’s corn meal and fresh milled yellow cornmeal will be perfect for it! ENJOY! Hi Melissa, i just made my corn bread from your posted recipe and yes it’s real delicious, moist, crunch on top and bottom, I can’t stop slicing it for taste. It’s simple and fast…thanks a lot for sharing your recipe. So glad that you loved it! Thanks for coming back to leave a great review! I’m American living in Australia, and I made this tonight with chili and it was a huge hit! My Australian friends are all officially in love with cornbread and it’s all thanks to your recipe! I love introducing friends to great foods that are new to them. I’m so glad they loved it as much as I do. And thanks for coming back to leave a comment, that really made my morning! Melissa, , thanks! This looks so simple to make, yet looking really satisfying and tasty! Melissa, it looks perfect and tasty! Can’t wait to have this anytime of the day, love it! Melissa, Thanks for your share! can you tell me the baking powder you used, active baking yeast or instant baking yeast? Baking powder is different than baking yeast. Where are you from and I’ll try to figure out what the product might be called there! 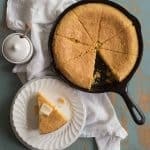 I made this recipe for my family in a cast iron skillet and it was the best cornbread any of us have ever had (and we’re from the South!). Sharing with everyone I know, they all keep asking for the recipe! Whooohooo! I love hearing that. And thanks for sharing it with you people, that’s so awesome. Melissa, thanks! Made this last night so quick, easy and tasty!